Only 3 Sport Hybrid SH-AWD with Technology Package models left in stock! Delivers 27 Highway MPG and 26 City MPG! This Acura MDX boasts a Gas/Electric V-6 3.0 L/183 engine powering this Automatic transmission. Window Grid Antenna, Wheels: 20 x 8 Shark Gray Twisted 10-Spoke -inc: Machine-Finished, Vehicle Stability Assist Electronic Stability Control (ESC). 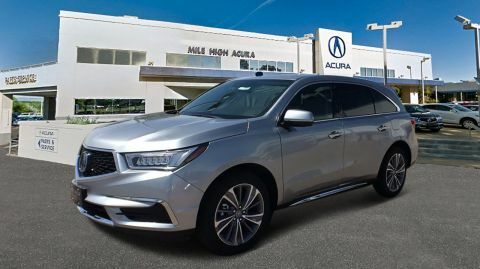 * This Acura MDX Features the Following Options *Valet Function, Trunk/Hatch Auto-Latch, Trip Computer, Transmission: 7-Speed Dual-Clutch -inc: electronic gear selector, sequential SportShift paddle-shifters and 4-mode Integrated Dynamics System (IDS)(Comfort, Normal, Sport, Sport +), Tires: 245/50R20 High Performance AS, Tire Specific Low Tire Pressure Warning, Tailgate/Rear Door Lock Included w/Power Door Locks, Systems Monitor, Strut Front Suspension w/Coil Springs, Speed Sensitive Rain Detecting Variable Intermittent Wipers. * Stop By Today *For a must-own Acura MDX come see us at Mile High Acura - Denver, 2799 South Havana, Denver, CO 80014. Just minutes away!